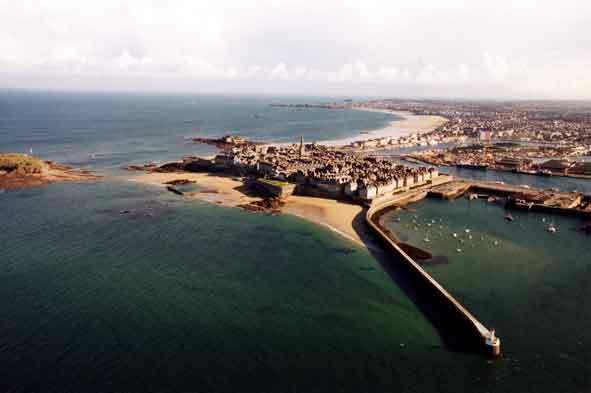 MICCAI 2004 will be held at the Palais du Grand Large at Saint-Malo in Brittany, France and the post-conference Workshops will be held in Rennes on September 30. Brittany is a large peninsula, bordered to the north by the English Channel and to the west and the south by the Atlantic Ocean. Hundreds of bays, inlets, and islands shelter the fishing boats that have sustained Bretons for millennia. Rennes is the capital of Brittany and, together with Lannion and Saint-Malo, is part of what is known as the French "Telecom-Valley", since most of the major players of the country's telecommunications industry have a site in this region (e.g., Alcatel, France-Télécom, Thomson, Matra). Saint-Malo is a corsair city (a corsair is a kind of official "pirate," hired by the king) and the home city of Jacques Cartier, the discoverer of Canada. The city is located on the north coast of Brittany, close to the Mont Saint-Michel and to Rennes. Saint-Malo is often compared to a great vessel preparing to set out to sea, always searching renewal and adventures. Every street corner, every shore recalls the city's legendary past, along the innumerable walks and seafront promenades. More than two and a half million visitors come here every year from all over the world to appreciate this exceptional site and its special atmosphere. A great variety of nautical activities are to be found here. And so as not to do things by halves, Saint-Malo is well-known as an international sailing capital: "la Route du Rhum", one of the biggest transoceanic race in the world, starts from the corsair city. Close to Saint-Malo, the Mont Saint-Michel, also known as the "Wonder of the Western World", is one of Brittany's best-known attractions. Surrounded by the most powerful tides in Europe, perched high on a rocky island, this medieval city and its abbey are a UNESCO World Cultural and Natural Heritage Site. For more information about the venue region, please click HERE. version française credit contact site_map what's new?